“To see is to forget the name of the thing one sees.” This is a quote frequently attributed to Paul Valéry, and the line has a quality that is at once both searching and poetic, making the attribution reasonable. I don’t know if Valéry actually said it (I can’t find the source of the quote), but I think of this line every once in a while: my mind returns to it as to an object of fascination, like an intellectual fetish. A good aphorism is perennially pregnant with meaning, and always repays further meditation. If seeing is forgetting the name of the thing one sees, and mutatis mutandis for the aesthetic experiences that follow from the other senses — e.g., to taste is to forget the name of thing one tastes, and so forth — we may take the idea further and insist that it is the forgetting of not only the name but of all the linguistic (i.e., formal) accretions, all categorizations, and all predications, that enables us to experience the thing-in-itself (to employ a Kantian locution). What we are describing is the pursuit of prepredicative experience after the fact (to employ a Husserlian locution). This is nothing other than the familiar theme of seeking a pure aesthetic experience unmediated by the intellect, undistracted by conceptualization, unmarred by thought — seeing without thinking the seen. In view of this, can we take the further step, beyond the generalization of naming, extending the conceit to all linguistic formalizations, so that we arrive at a pure aesthesis of thought? Can we say that to think is to forget the name of the thing one thinks? The pure aesthesis of thought, to feel a thought as one feels an experience of the senses, would be thought unmediated by the conventions of naming, categories, predication, and all the familiar machinery of the intellect, i.e., thought unmediated by the accretions of consciousness. It would be thought without all that we usually think of as being thought. Is such thought even possible? Is this, perhaps, unconscious thought? Is Freud the proper model for a pure aesthesis of thought? Possible or not, conscious or not, Freudian or not, the pursuit of such thought would constitute an effort of thought that must enlarge our intellectual imagination, and the enlargement of our imagination is ultimately the enlargement of our world. All acquisition of knowledge is an enlargement of the Self, but this enlargement is best attained when it is not directly sought. It is obtained when the desire for knowledge is alone operative, by a study which does not wish in advance that its objects should have this or that character, but adapts the Self to the characters which it finds in its objects. This enlargement of Self is not obtained when, taking the Self as it is, we try to show that the world is so similar to this Self that knowledge of it is possible without any admission of what seems alien. The desire to prove this is a form of self-assertion and, like all self-assertion, it is an obstacle to the growth of Self which it desires, and of which the Self knows that it is capable. Self-assertion, in philosophic speculation as elsewhere, views the world as a means to its own ends; thus it makes the world of less account than Self, and the Self sets bounds to the greatness of its goods. In contemplation, on the contrary, we start from the not-Self, and through its greatness the boundaries of Self are enlarged; through the infinity of the universe the mind which contemplates it achieves some share in infinity. The obvious extension of this conception of impersonal self-enlargement to an ethics of thought enjoins the self-enlargement of the intellect, the transgression of the limits of the intellect. It is the exercise of imagination that enlarges the intellect, and a great many human failures that we put to failures of understanding and cognition are in fact failures of imagination. 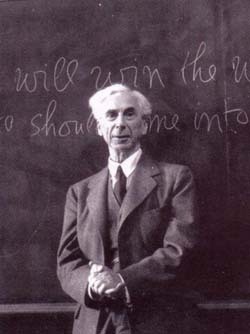 Bertrand Arthur William Russell (1872 – 1970) formulated an ethic of impersonal self-enlargement.